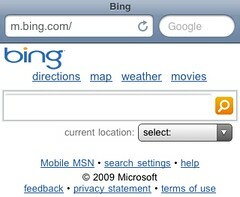 Some users have noticed a bug with Bing Mobile at m.bing.com, where Microsoft is loading the wrong language for that user. We have a known issue that affects a small percentage of people using Bing on their mobile devices, where Bing shows up in the wrong language. Microsoft both notes how you can help them fix the issue as well as fix the issue on your device. Microsoft said first asked that you help them troubleshoot the issue by going to http://m.bing.com and then type in the query “BINGLANGTEST” and then send them an email (bingmob@microsoft.com) with the date/time you encountered the issue. Then to fix your issue, just go to http://m.bing.com/?lc=en-US on your mobile device. This will reset the language back to English. Previous story: Don't Want Your Social Security Number or Identity Card Number On Google?